In the past, I would have hesitated before posting this recipe. It would have seemed too commonplace and simple. Instead, I loved how this site was a place where I could push myself to make more complicated recipes and experiment with different flavours. However, this is the kind of recipe that I am desperate for lately and I am so glad to have a place to keep it. How could I have ever thought twice about posting a recipe that gets better as it sits, is fast, cheap and easy to make, and is healthy and filling at the same time? Right now, this is exactly the type of recipe that I want to have at the ready, that I can draw on when my mind is totally blank about what to keep in the fridge for lunch. 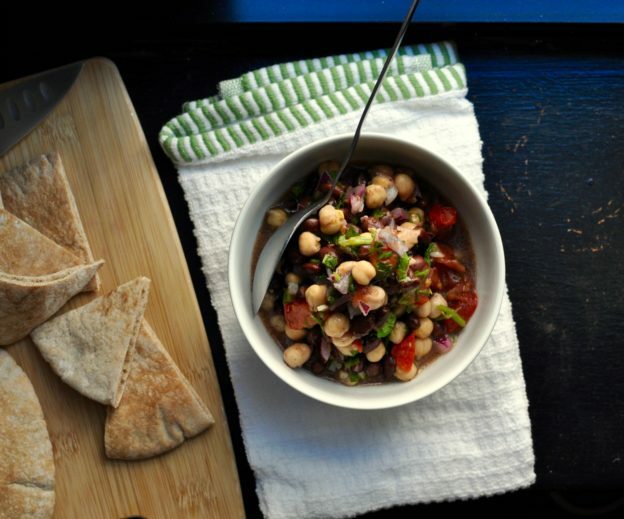 Even more importantly for me, I love that this bean salad takes up a small amount of prep space and creates minimal mess. Now that I’m working in such a small kitchen, this has become a priority for me and I am making more and more recipes that don’t result in kitchen chaos (which happens very quickly and easily these days). This entry was posted in Cheap, Lunch for Work, Salad, Side dish, Snack, Vegan and tagged bean, bean recipe, bean salad, bean salad recipe, Cheap, cheap lunch, Easy, fast, fast lunch, food, Healthy, healthy bean salad, healthy bean salad recipe, healthy lunch, healthy snack, lunch, recipe, Salad, simple, simple bean salad, simple bean salad recipe, simple lunch, Snack, Vegan, vegan lunch, vegetarian on November 21, 2016 by mysecondbreakfast. 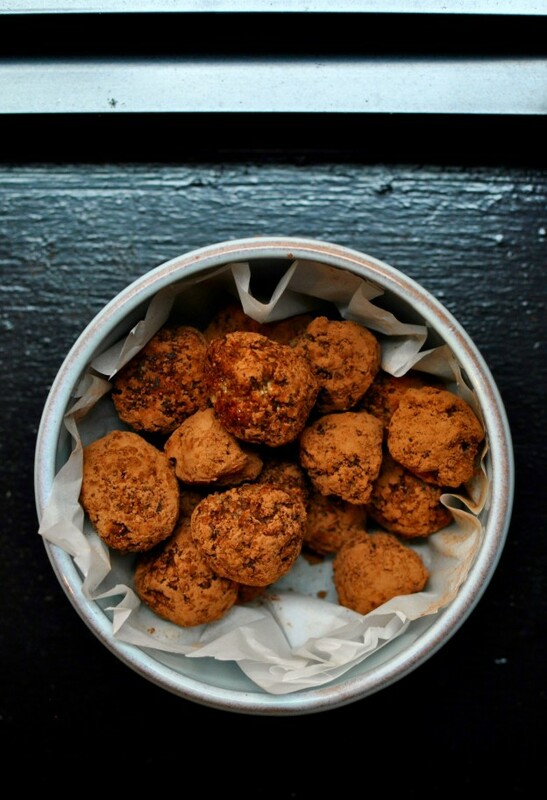 You may notice that these hazelnut cookies bites are quite similar to the last recipe that I posted. You would be correct. They are both cookies and both chocolate + hazelnut flavoured. In fact, the recipe that these are based off of came up while I was searching for biscotti recipes a couple of weeks ago. On top of the random google searching that I was doing, I also went to all of my favourite blogs to see if there was any biscotti recipes to build off of. In my searching, I came across the recipe that these cookies are based off of on 101cookbooks. They didn’t look like biscotti to me but I instantly decided that I wanted to make them as well. In the end, I gifted both the biscotti and these cookie bites (and kept some for myself of course!). This entry was posted in Chocolate, Dessert, Potluck Dishes, Snack and tagged cookie, cookies recipe, Dessert, Easy, easy cookie, easy cookie recipe, easy recipe, food, gluten free, gluten free cookie, gluten free cookie recipe, gluten free recipe, Hazelnut, hazelnut cookie, hazelnut cookie recipe, hazelnut recipe, Nut, nut cookie, nut cookie recipe, recipe, Snack, snack recipe on October 9, 2016 by mysecondbreakfast. -First, everyone loves chocolate and hazelnut (right?!). 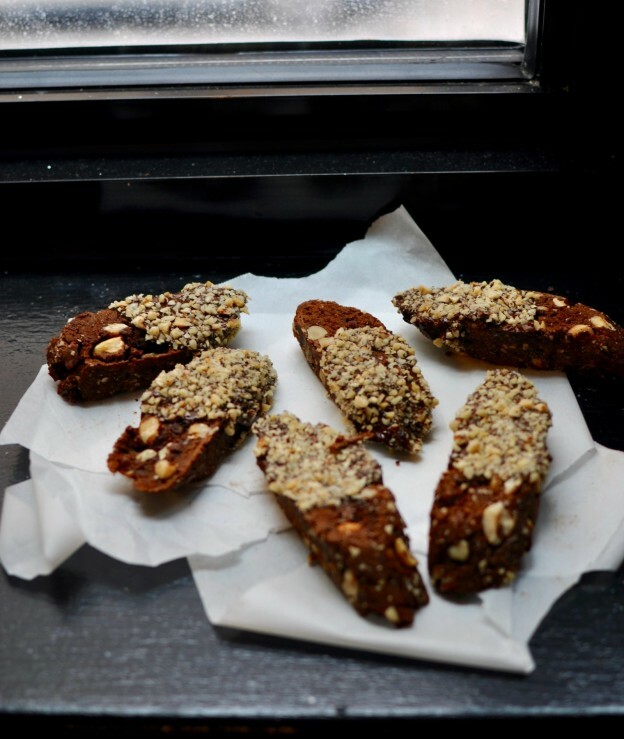 -Second, the biscotti are super easy to pack up and transport. Avoiding a mess on the subway (and in my purse) is essential. -Third, I am confident that most people can eat these every day, with a cup of their favourite hot beverage, and never get sick of them. -Last, they freeze super well, which means you aren’t forcing someone to eat tons of dessert if that’s not in their regular routine (although I would have no trouble finishing them off). This entry was posted in Chocolate, Dessert, Potluck Dishes, Snack and tagged biscotti, biscotti recipe, Chocolate, chocolate biscotti, chocolate biscotti recipe, chocolate hazelnut, chocolate hazelnut biscotti, chocolate hazelnut biscotti recipe, cookie, cookie recipe, Dessert, food, Hazelnut, hazelnut biscotti, hazelnut biscotti recipe, recipe, Snack, snack recipe, Sweet, tea cookie, tea cookie recipe on October 3, 2016 by mysecondbreakfast. Since we moved, Whole Foods is the biggest, closest grocery store to us. There was a Whole Foods where we lived in Vancouver but we never shopped there because of the plethora of convenient, high-quality, cheap, small grocery stores. Even though I had been in a number of Whole Foods, walking into the one in New York was a totally different experience. I felt overwhelmed for the first time since moving to the city. There was so much stuff and so many people buying that stuff. However, once I was able to repress how overwhelmed I felt, I was definitely intrigued by the varieties of peppers, apples, pears (etc, etc) that I had never heard of. There were also a lot of fruits and vegetables that were less commonly available in grocery stores back home (I tried sunchokes for the first time!). During my most recent trip to the store, a small punnet of fresh black figs caught my eye. Even though I have seen fresh figs, this was my first time buying them. 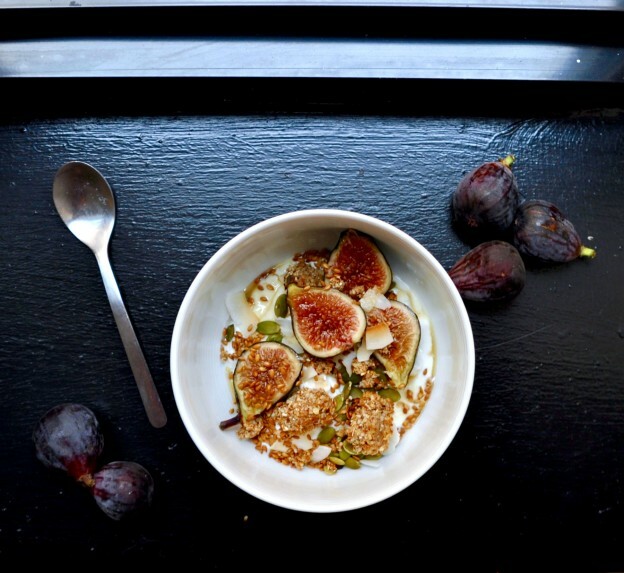 The main reason for buying them was to make this fig and granola yogurt bowl. It has taken some time for our blender (smoothies!) and pots (oatmeal!) to arrive so my breakfast routine has changed. Other than cold cereal, I have been eating yogurt bowls. I load up the yogurt with the same delicious seeds, nuts and fruit as I tend to do with my oatmeal or smoothie bowls: figs were a perfect addition. This entry was posted in Breakfast, Dessert, Snack, Vegan and tagged Breakfast, chewy granola, chewy granola recipe, easy granola, fig, fig recipe, food, granola, granola recipe, health, Healthy, healthy breakfast, healthy recipe, recipe, simple granola, vegetarian, vegetarian recipe, yogurt, yogurt bowl, yogurt bowl recipe, yogurt recipe on September 22, 2016 by mysecondbreakfast.